Faba bean (Vicia faba) is native to northern Africa and south-west Asia, where it is still extensively cultivated. 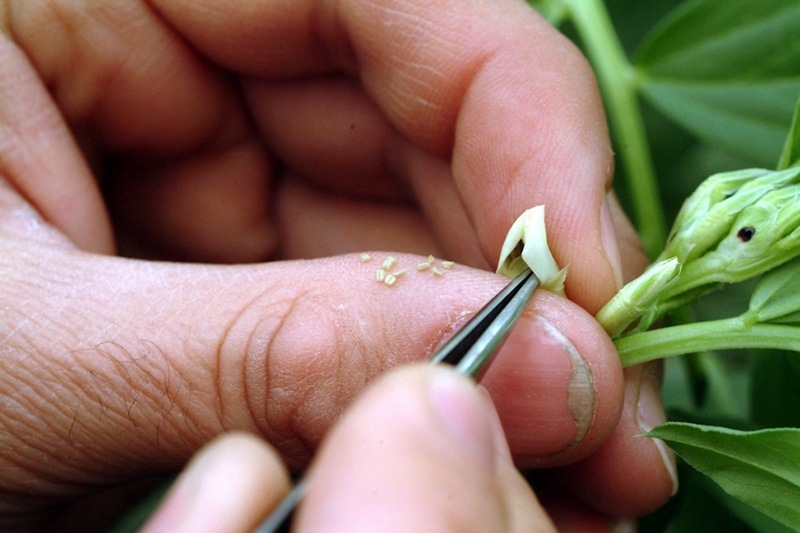 Although classified in the same genus as the vetches (Vicia), some botanists argue that the species should be included in a separate monotypic genus, Faba. The species was domesticated in the Near East around 8,000 years ago and then spread to Europe, through Eurasia and to parts of the New World. It is widely cultivated around the world for the dried and fresh beans, for animal fodder and as a green manure. No wild progenitor of faba bean has been identified and the species does not produce fertile hybrids with any other Vicia species. The plant differs from most other vetches in that the leaves do not have tendrils for climbing. The pods are green, broad and leathery. When mature they are blackish-brown with a dense, downy surface. Faba bean is diploid (2n=12) and partly out-crossing, with cross-pollination ranging from 8% to 84% and an average of 35%. Given the high degree of cross-fertilization possible within Vicia faba germplasm, it is important to optimize the regeneration procedure. Freshly harvested seed should be processed rapidly and efficiently to maintain seed quality so that the periods between regenerations are as long as possible. The largest genebank collection is held by ICARDA in Lebanon. Other large collections are held by the Australian Grains Genebank, the Leibniz Institute of Plant Genetics and Crop Plant Research in Germany and the N.I. Vavilov Research Institute of Plant Industry in Russia.